The Daily schedule view gives you a detailed forecast of exactly what sales and deliveries you might have -- by hour -- so you can refine your schedule to perfection! At the top of the screen, you can change the date. You'll see forecasted sales, your labor goal and budget, scheduled hours, schedule $ and schedule labor %. You can choose to include budgeted salary (which will add distributed salary costs to your budget line). Learn More about how the forecast and budget works. At the top of the chart, you'll see forecasted sales by hour and a forecasted delivery count. Below, you'll see the individual employees who are scheduled. Click on an employee name to edit the shedule for the day. You can also edit a schedule by dragging the blue bar. 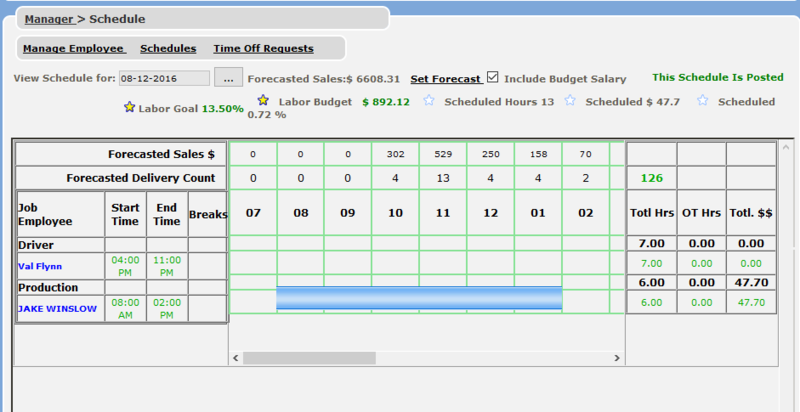 As you make changes, you'll see the calculations for total hours, total overtime hours and total $ update. Select the job type, the employee, and enter the start and end time. If the end time is past midnight, click the "Next Day" box. Breaks will automatically appear based on your break rule configuration. Click save, or save & new to continue entering employees. Once you've got the schedule ready to go, be sure to press the POST button at the bottom of the screen. This will publish the schedule to your employees and send notifications. At the bottom of the screen, you'll also find buttons to copy a daily schedule from a prior day, Print the schedule (this takes you to the Employee Schedule Report), and clear the schedule. If your schedule is posted, the Post button will change to Unpost (Hint: If a weekly schedule was posted, you can't unpost just 1 day. Go back to the weekly view to unpost). That's it - your daily schedule view!